Winter and frost is the worst enemy for rocks. Snow, rain are all elements that seep through the rock and expands when it freezes, causing a rock to crack. Therefore, extra precaution (not only) in spring is necessary when you venture out. Even at sport climbing crags rock fall can happen. I was climbing when the climber in the neighbouring second pitch shouted out “rock”! I look up at the rock that was a size of an apple falling straight into to the crowds below. I screamed “rock” too! But nobody looked up, everybody was busy looking everywhere else. I was horrified. There were at least 20 people below, it was a busy weekend at Barmstein. The rock kept falling when it suddenly hit a protruding cliff and broke into smaller pieces. One of the bigger ones hit my partner on the head who was belaying me. I saw him lift up his hands to his head, holding back the blood now gushing out. At this moment I grabbed the nearest quickdraw I could get and made myself a midroute anchor. Friends of ours came by to help him and took over the belay as they lowered me down. The guy who dislodged the hold had rappeled down by then and took responsibility. He brought him to the hospital. A few hours later, my partner came back with 10 stitches on the head and a light concussion that lasted weeks. So lucky, it wasn’t more. For the first time we discovered the importance of wearing a helmet. A little late. I didn’t even own one at that time. “It was so uncool.” “And who needs a helmet anyway.” You bet, we learned it the hard way. 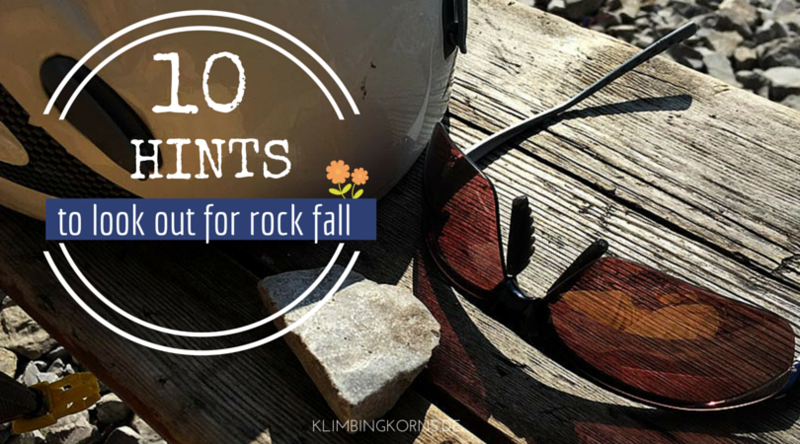 So what critical situations are there to tell you to be extra attentive, especially when it comes to rock falls? Rock fall hints at the crag. 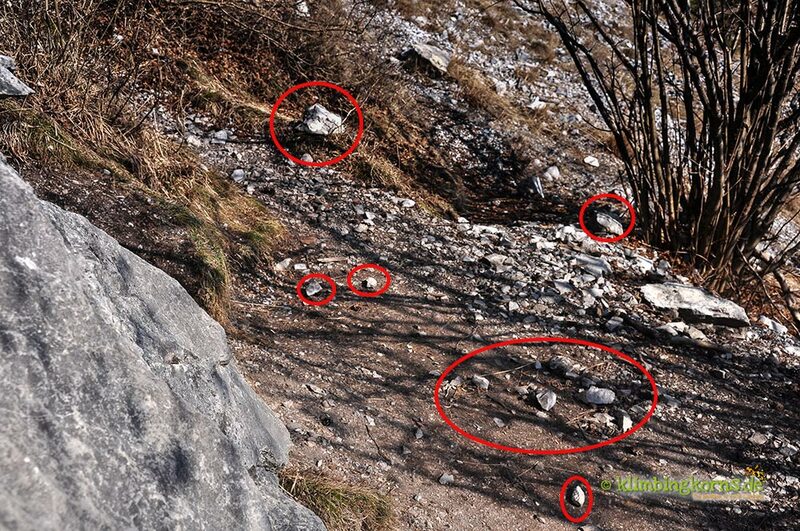 There are not many places where bolting takes place when rock falls are very evident. But there are a few existing ones in the Alps. Look out for fresh rock that has been recently dislodged on the grounds. They stand out quite oddly amongst the others. Dont stand directly under a climber while you belay. He might dislodge a rock at any time. Be attentive if you don’t have a choice. Also don’t sit anywhere under or near him/her. Don’t place your babies below a route that someone might want to climb later. 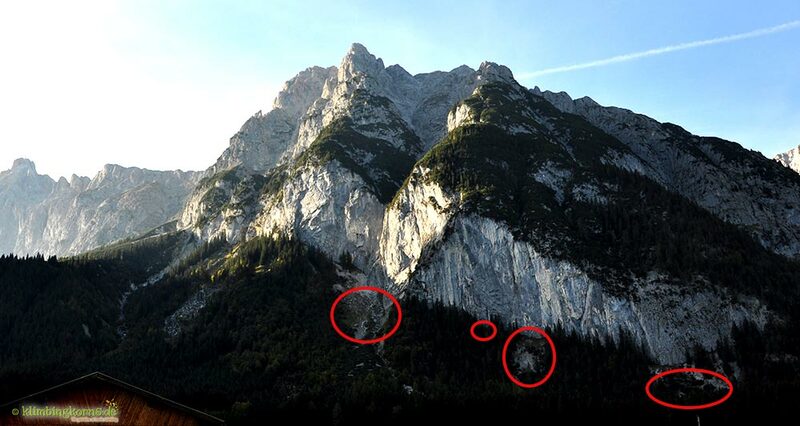 There are a few areas (not only) in the Alps where sometimes multi-pitch routes are just next to the sport climbing areas. If there are climbers above, there’s also a chance that something might come flying down. When the crag is vertical, crumbly or freshly bolted. Chances are good that a rock can dislodge itself from unseen elements (strong stormy winds) , or while climbing. Stalagmites in an overhang can break too. When the cliff over the crag is a slope. A rock that falls on a slope above the crag, will just roll/bounce off that slab like a good drainage system. Avoid gullies/chutes / couloirs as well. You’ll see all the fallen rocks gathered in a concentrated area below. Some of the sports climbing sectors are just above the circles. Rock falls occur here so frequently that trees stop growing. Also, observe the slopes above the wall. Not only rock can fall but trees, branches and everything else from above. Sometimes, even if it isn’t evident, a rock can hit another protruding rock and changes its direction towards you. After winter and heavy rainfalls. Erosion is a natural process. Crags that are sometimes compact and solid might be different after a long, cold winter, or strong periods of rain. 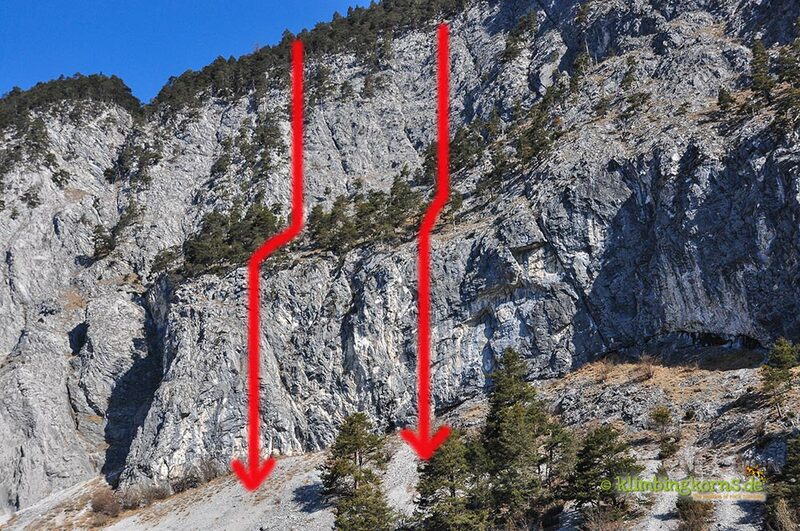 Small snow avalanches in winter/spring above a cliff can set off a rock falls too. on top of a canyon or the cliff can sometimes send a shower of stones to the cliff below. I see this often. The frozen belayer immediately flees into the sun to warm up. Usually, the sun zone is just a couple of meters away from the cliff, and directly where rock falls can happen. Find a safe spot further off, where you can do that without getting hit from above. People and rope are the number one reasons that cause rock fall. Avoid the crowds or wear a helmet. Be careful not to dislodge any stones while you climb. If you are suspicious about any hold, knock on it to listen to any indication of hollowness. Avoid it, if you think it might break. If you dislodge any stone from above, warn your belayer below. Yell “Rock” / “Stein”. Belayers, listen to your lead partner. If you can’t hear him, watch. Carefully. Even though being social is important, dont chat while belaying. Pay attention to your environment and especially to your leading partner. Accidents happen usually at that second when you’re not listening or watching. While pulling the rope down the ends of the rappel rope, it might dislodge loose rocks if the crag is vertical, a slope or hits a protruding rock. A rope that gets stuck can also cause blocks to dislodge when you’re tugging it to get it lose. Rock falls don’t always happen. But it can and it happens when you least expect it, so it’s good to have your helmet along on suspicious terrains. We have seen many different types and qualities of rock, and at the same time experienced some situations which we thought it was important to mention. Comment below, if there are more points missing. Climb safe and enjoy the start of the season!